San Juan Island’s community chorus wants islanders to leave those “Rainy Days and Mondays” behind and “Let the Sunshine In” by “Feelin’ Groovy” at their spring concert at San Juan Community Theatre on Friday and Saturday, April 6-7 at 7:30 p.m. 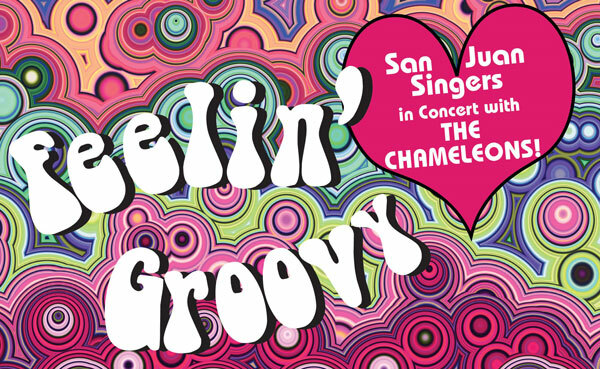 The San Juan Singers team up with the celebrated San Juan Island rock group, The Chameleons, for a night of memorable pop hits from the ‘60s and ‘70s, with music from such legends as The Beatles, The Beach Boys, Carole King, ABBA, Queen, and more. “The palpable energy of this well-known and well-loved music has inspired the Singers and we’re very excited to share that feeling with our island community,” said Singers director Angel Michaels. She adds that The Chameleons—featuring Darvis Taylor on lead guitar; Steve Lembcke on bass; Michael Linehan on drums; and the vocal stylings of Kira Sable—will add even more energy and excitement to the performance. And to add to the groovy spirit of the evening, the audience members are strongly encouraged to dig out those tie dye shirts and bell bottoms and other favorite looks of the ‘60s or ‘70s. The Business Partner for the concerts is Lake Kennedy McCulloch, CPA. Tickets are $20 for adults and $10 for student reserved and are available online at www.sjctheatre.org or at the SJCT Box Office (360) 378-3210 (open Tuesdays through Fridays from 1:00 p.m. to 4:00 p.m. and Saturdays from 11:00 a.m. to 2:00 p.m.).